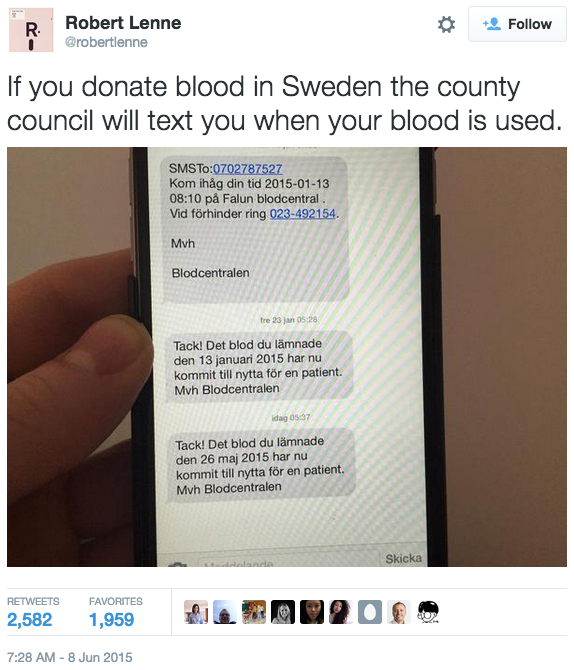 If you donate blood in Stockholm, the County Council will text you when your blood is used. Donating blood is like donating anything else. It feels great. But you feel MUCH better when you know where it’s going and how it will be used. With declining blood donations across the First World, Sweden enlisted a new incentivization technique to try to grow the public’s interest and participation. After an initial donation, donors are thanked both in person, and via text message. But the surprise and delight moment occurs when donors receive a follow-up message explaining when and how their blood has been used. Additionally, the messages give donors positive feedback about how they’ve helped their fellow citizens, on paying it forward. This simple action warms hearts and hopefully, inspires another donation or spreading of the good word to others. Donors and officials alike can now leverage social media to notify the public about when the bank is in need. In addition, the County Council has opened up to the public, as accurately as they can, regarding current blood levels by developing a live local blood bank stock checker. After a successful run in Stockholm over the last 3 years, and striking a chord with the international public, the program is beginning to take shape in other parts of the community-conscious country. Taking the time to send each donor a note regarding how they have helped another, and where, is both extremely personal and rewarding. Timing is key here, in addition to sentiment. Giving blood is already rewarding at the time of donation. But donors often forget to come back and eight weeks later when it is safe to donate again, especially if it was a bit frightening or if they were socially coerced into doing it with a friend, school, or employer. The text message will likely arrive weeks later as a very pleasant surprise and reminder of the impact their gesture has made. That is impactful. 1. Keep the dialogue going. Relationships are built on ongoing meaningful exchange. An exchange between two parties. The County Council reached out to donors both to say thank you, and to follow-up - creating another, deeper level of meaningful value. If you’re trying to leave a meaningful impression, generic messaging will not cut it. Create value by knowing and sharing something personal with the person on the other end. People have come to expect a level of personalization or customization. Familiarity makes people feel special. And that fosters loyalty. Giving blood is already a very rewarding experience, so don’t hesitate to reinforce that positive moment weeks later when it goes into practice. Be confident this will draw that deep emotion back to the surface, taking big strides toward continuing the dialogue.